Included with the BSG10X is a 48" lat bar a low row bar and an abdominal-harness. Read the tech specs below to see the many features built into this incredible new Powerline gym. 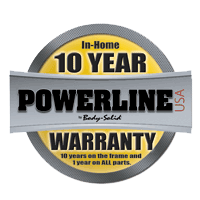 The BSG10X also comes backed by the Powerline Exclusive 10 Year Warranty! You can’t afford not to make this a part of your own home workout center! box 1 (of 1) - 82" x 28"13" | 184 lbs. sp50 3 boxes of weights | 150 lbs.